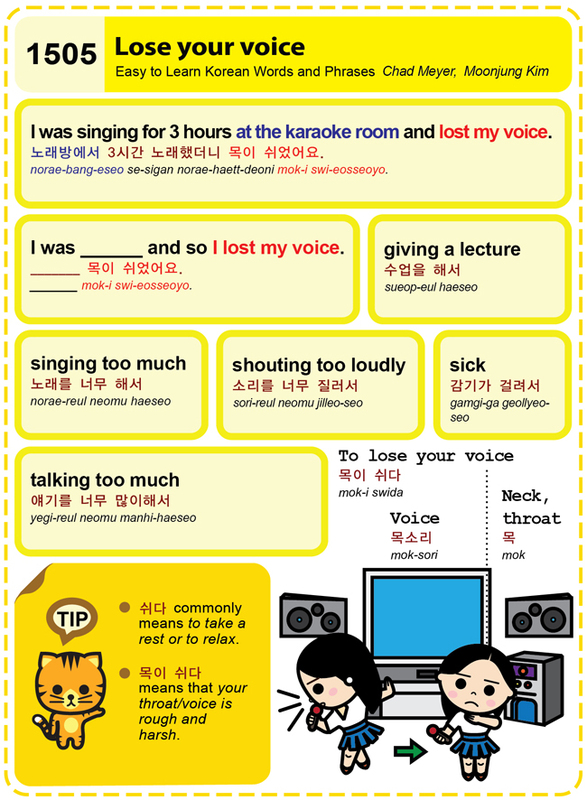 Easy to Learn Korean 1505 – Lose your voice. This entry was posted in Series and tagged giving a lecture, I was singing for 3 hours at the karaoke room and lost my voice., lose your voice, lost my voice, mok, neck, sick, swida, talking too much, throat, throat or voice is rough and harsh, to take a rest or to relax, voice, 감기가 걸려서, 노래방에서 3시간 노래했더니 목이 쉬었어요., 목, 목소리, 목이 쉬다, 목이 쉬었어요, 수업을 해서, 쉬다, 얘기를 너무 많이해서 by easykorean. Bookmark the permalink.